Were you concerned EA's soon-to-be-released Dead Space would be lacking in the story department? Well, you shouldn't be. In fact, Dead Space's story is so large and expansive that they've been able to split it up over a series of animated comics and even an extremly bloody cartoon movie. To go along with those is an interactive, flash-based website, No Known Survivors, which takes a closer look at the game's backstory through two different prequel stories focusing on specific crew members before all hell breaks loose on the Ishimura.I received an extensive walk-through yesterday about the development process behind EA's No Known Survivor website. Since its launch back in August, the site has been updated regularly with new episodic content leading up to the game's eventual release on October 14th. Deep Focus Creative Director Nick Braccia, who headed the project working alongside EA, was excited for the opportunity - and the challenge - of bringing an interactive experience that would get fans jazzed up about the story, and at the same time, work uniquely in a web browser. "I looked at the story [EA] had and was primary interested in ways of taking elements of the game story and blowing them out in new ways that work best on the internet that wouldn’t work in other places," said Braccia. "I think the Dead Space story is really rich and they put a lot of time in it." The four chapters of the first story, Misplaced Affection, has recently been completely revealed. Without giving too much away, the plot involves a love interest between a man named George Greggs, an Organ Replacement Technician on-board the Ishimura, and a female patient with missing fingers (ew!) named Jane Gauthier, The first chapter of the second story, 13, launches on Monday the 29th. You play the role of a man named Gavin, who works with two other crew members on-board a TUB space station. 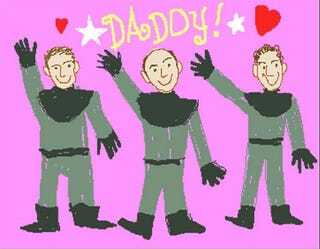 You get to know how close Gavin is with his family upon viewing the 3 Happy Spacemen video (pictured above) sent from his daughter. Each of these chapters play like your typical point-and-click game. You move the mouse around the room looking for objects to highlight so you can receive some information or clues. These range from simple documents to fully recorded audio clips. My biggest complaint is the fact that you never leave either of the two rooms. Each story takes place in the same room for all four chapters. You can't move around or leave and go to another area. Braccia noted while he would have obviously loved to create larger, more interactive environments, it basically came down to not having enough time. "In terms of production, it wasn’t really feasible in the time line because of what went into getting the assets and building the rooms," he said. "We made the decision to tell each of the stories as these acts in a play on the same set. Time is going by, the voice over is letting you know it’s getting scarier and changing the assets inside that environment." There are no plans currently to bring this to consoles whether through downloadable means or shipped on the game disc. It'll be up on the web for the foreseeable future, even after Dead Space is released. Braccia was quick to point out the benefits of being able to present a game story in this particular fashion.. "That’s what I liked about us being able to do the web experience and have some freedom inside that to tell the story," said Braccia. "There’s things you can do that makes sense in a narrative in following the point-and-click approach, it’s a fairly deep point-and-click story, there’s things you can do there that don’t necessarily make sense in a console-based game, unless you want to sit around watching a lot of cinema scenes." So there you go. Go to the site and check it out and click around. There's actually a contest going on where you'll be able to win copies of the game and, possibly get your hands on a life-size Issac Clarke’s helmet! (No, that's not me). Go here for more pictures of the helmet.